My contemporary Silver Bangle is unique to JBJ as handcrafted by me. 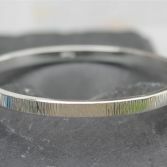 Its made using solid sterling silver and the bangle measures 2.4mm thick and 5mm width so is a quite a heave piece. 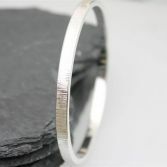 I have given the outside of the bangle a fine hammered texture which catches the light beautifully. The bangle has full UK hall marks. 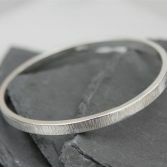 I currently have one bangle in stock which is a size small/med with an inside diameter of 6.4cm. 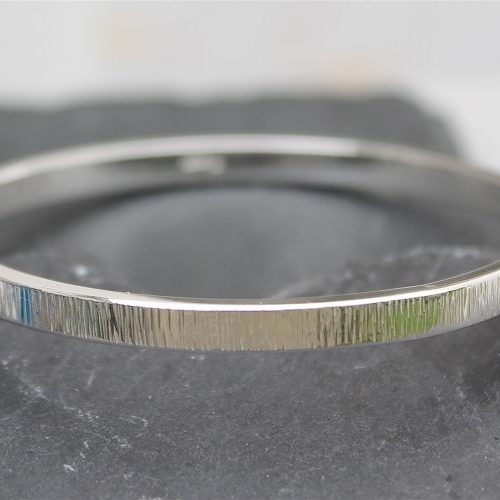 I can make other sizes but please email me first to discuss when you need it for as the bangle will need to be sent for hallmarking. 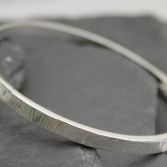 Your Contemporary Silver Bangle with be posted in a gift box and padded envelope and post via Royal mail 1st class signed for delivery to any UK address free of charge.